The stamina of this breed can certainly outrank most, as it tends to be long-winded and full of life. It is a very loving dog, that also is independent and smart. It has a great abundance of confidence and is constantly alert and aware of its surroundings. If this dog is trained, it is very obedient and very responsive to training. However, no matter how well trained this dog may be, if it is not receiving adequate physical and mental exertion, then it can become quit unbearable to live with, due to its disruptive outbursts. However, if you ensure that your dog is well taken care of, then it will show its owner loyalty, devotion, and complete obedience as a companion. If it is confronted by a stranger, it tends to be reserved and not as open or friendly. It has a very protective nature. 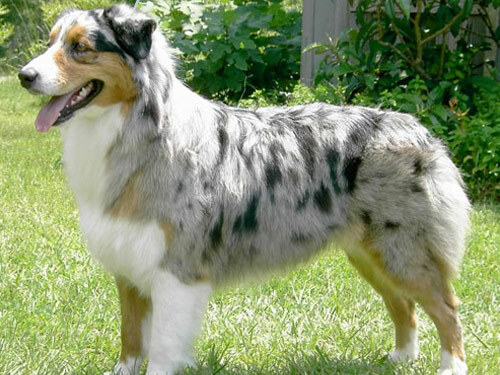 The Australian Shepherd requires daily exercise, as do most dog breeds. However, they do best when they are physically and mentally stimulated. This is a very bright breed and if its mind goes stagnant, it can become disruptive to its surroundings causing it to misbehave. This breed could survive in the great outdoors if speaking of only temperature requirements, however, the Australian Shepherd is in dire need for human contact. If it does not have a regular dose of human contact, it will not be able to survive in the outdoors. This is a great family pet due to its love and yearning for a tender touch. Its coat tends to be slightly longer, as it is not considered a short-haired breed and it requires brushing one to two times weekly. Australian Shepherds tend to have more health issues that most dog breeds. The reason for this is unknown, but it is why dog experts everywhere will stress the importance of healthy choices if you are an Austrian Shepherd owner. The major concerns to keep an eye out for include cataracts and CEA. These are the main two conditions to keep an eye out for. Minor concerns include Chronic Hip Dysplasia, which can actually be quite serious if it goes untreated, nasal solar, Pelger-Huet syndrome, iris issues, CEA, and hypothyroidism. Sometimes, owners will se lumbar sacral in their dogs, along with epilepsy, PRA, vWD, PDA, and PPM. All of these need to be treated at the first signs of them. Suggested tests to get done in order to keep your breed healthy include hip tests, eye tests, thyroid tests, and a screening for CEA. If you keep your dog healthy, it can live anywhere from 12 years old to 15 years old! An interesting fact about the Australian Shepherd is that it is not actually an Australian breed after all. It came to America from Australia, which is how it got its name. It is said to have originated in Europe during the 1800s. Herding dogs were in demand in Australia and in America, which is how they found their way to the states. In the 1950s, the dog became quite popular doing tricks and joined different rodeos. The dog was officially coined a breed in 1993 by the renowned AKC. After this, their popularity climbed however these numbers are skewed because many people own Australian Shepherds that are not registered as such because they remain unregistered with the AKC.